As LSI’s recent 400 million dollar acquisition deal comes to a close, SandForce is launching a new controller from its SF-2000 family that is aimed specifically at the cloud computing market. 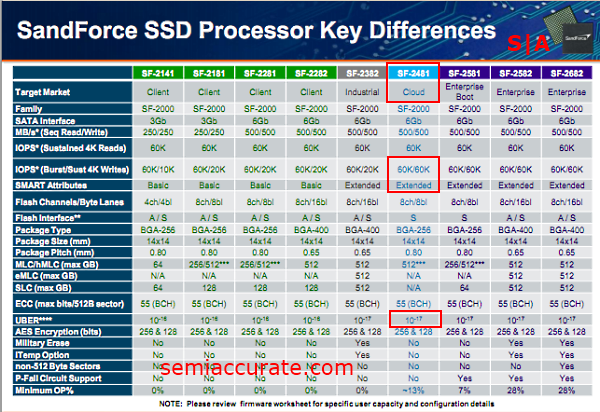 Sandforce is calling the device the SF-2481 SSD Processor. Due to its nature as a derivative of the SF-2000 family this chip has a lot of features that you’ll recognize from high-end consumer SSDs. It uses a 6Gb SATA III interface and offers support for up to 512GBs of Multi-Level Cell flash memory. Additionally this controller looks to split the difference between SandForce’s Consumer SSD line up and its Enterprise SSD line up in an attempt to find the sweet spot between reliability and price. 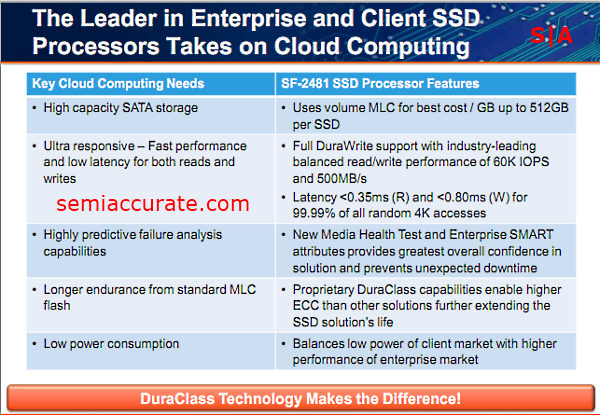 SSDs using this new chip are expected to be on the market in early Q1 of next year. In order to improve time-to-market SandForce is offering the SF-2481 in a pin compatible package to the already widely available SF-2281. SandForce appears to be quickly pushing firmware development for this controller forward. Beta firmware is currently available, with mass production firmware expected in December. Despite earlier firmware issues with SF-2000 based devices, SandForce seems confident that things will be less eventful with this new version. Updated: December 13, 2011 Correction between “drive” and “controller”.